HOLDEN'S David Reynolds has become emotional after securing his first Supercars pole position in three years. 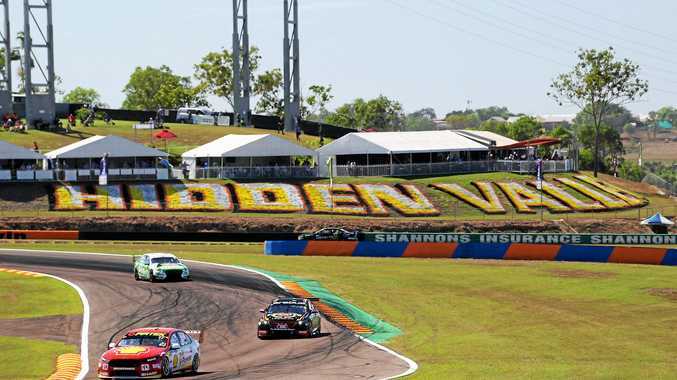 The Erebus Motorsport flyer produced a scorching lap in qualifying at Darwin's Hidden Valley on Saturday to ensure he starts at the front of the grid for the afternoon's race. Reynolds edged out championship leader Scott McLaughlin to secure his first pole since 2015, in New Zealand, and the eighth of his career. He is fourth in the championship standings, 318 points behind Ford rival McLaughlin going into the seventh round of the season. Reynolds admitted he shed a tear after realising what he had achieved. "It means a lot for me," he said. "Usually he's (McLaughlin) like the qualifying king so I can't be any happier. "I was actually crying a bit then in the car after that because we haven't had a pole position with this team yet. This is unbelievable." Reynolds' rookie teammate Anton de Pasquale rounded out the top three for his best qualifying result. The 22-year-old has never raced at the Northern Territory circuit before this weekend. "It's very intense. That first lap, that's when it's going to count and my first time and I'm really enjoying the track," he said. Revitalised Nissan veteran Rick Kelly continued his form resurgence to qualify fourth and championship contender Shane van Gisbergen finished behind him. The 42-lap race starts at 4.45pm.